General description: Male wings yellow with prominent black tiger-like stripes and wide black borers; hindwings with yellow marginal spots and single black tail. Thorax and abdomen yellow with black stripes. Female has two forms. 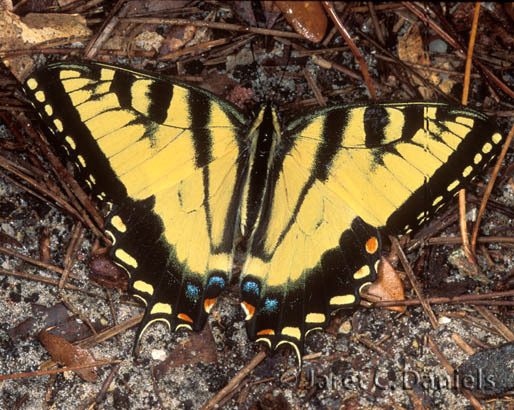 Yellow form as male but with increased blue scaling in black hindwing border. 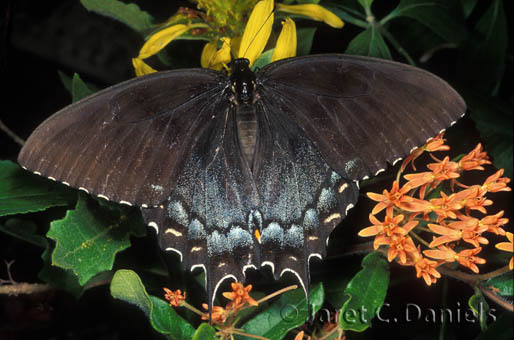 Dark form black or with faint stripes; hindwing with blue scaling and yellow marginal spots. Ventral hindwing with faint darker stripes. Additional Information: Adults have high somewhat gliding flight and feed with their wings outstretched (not continuously fluttering). from Canada all the way to Mexico. egg, caterpillar, chrysalis (cocoon), and adult (butterfly). (cocoon). I will emerge as a butterfly in a few weeks.